GCF Pittsburgh: Please help us to clear the TB/geocoin inventory. We will move all remaining trackables to unknown location soon. Thank-you to everyone who attended, the volunteers who helped before during and after the event, and the coin vendors who helped make this event possible with their beautiful coins. See yinz in Salt Lake City! A BIG thanks to all of the vendors and volunteers who helped make this event possible. For more information, please visit the event website HERE and the GCF Pittsburgh Forums HERE. For Friday arrivals, stop by Radioactive Coconut's Campfire and Cocktails HERE. If you want to see Pittsburgh from a unique perspective, make sure that you visit D@nim@l at What's The Point of This Event Anyway? (GC1FKEZ) HERE. To register for the Meet & Greet, please click HERE. 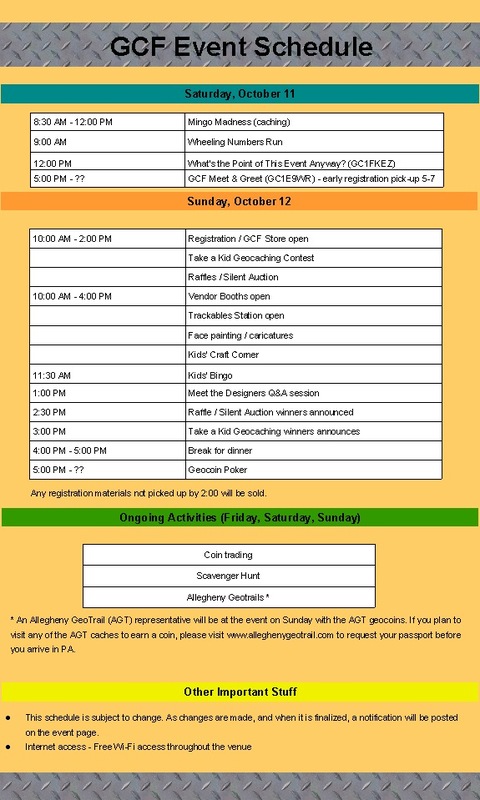 Please note that early GCF registration pick-up will only be available between 5:00 PM - 7:00 PM on Saturday, October 11th. Only authorized vendors shall be permitted to sell items at GCF, and only in the authorized vendor area. Anyone caught selling items at the event venue that is not on the vendor permit, will be asked to leave the venue by property management.